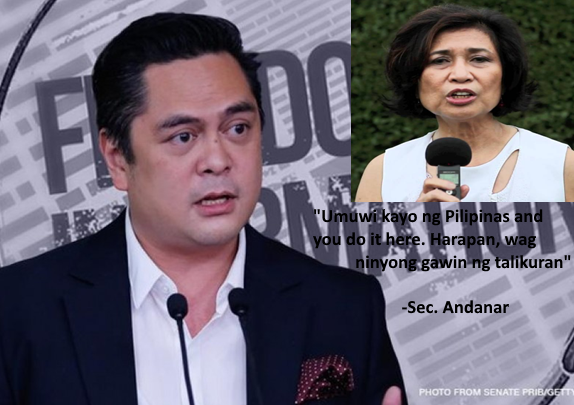 In an interview of Communications Secretary Martin Andanar, he dares Filipino-American community leader and philanthropist Loida Nicolas-Lewis to go home in the Philippines to air her gripes vs President Rodrigo Duterte instead of plotting the ouster in the United States. "Umuwi kayo ng Pilipinas and you do it here. Harapan, wag ninyong gawin nang talikuran and at the same time relaxing in the comforts of your home in the United States or maybe somewhere. You have to be here," Andanar said. "Didn't Ms Lewis also hear or watch the news when the President asked for an extension? Is it very difficult to understand, Ms Lewis?" Andanar on the promised made by President Duterte for eradicating drug problem was unmet. According to Andanar, Lewis keeps on stoking a fire for people to go against the administration just because her preffered candidate for president, Mar Roxas, lost. “There was an audience and then she wrote something good and now, then she says one thing, she says another thing. Kaplastikan eh.” Andanar recalling President Duterte and Loida Lewis meeting in Davao after the presidential race. "I'm not saying I believe that [Lewis is behind a plot to oust Duterte]. We're investigating this, but definitely, Ms Lewis' name has been circulating. She's been very conspicuous in number one, supporting the opposition, and conspiciuous also in not supporting this administration," he said. "If you keep on saying negative things about the President, destroying the name of the President outside this country, then you are doing disservice to the nation," said Andanar. According to Andanar, Lewis keeps on stoking a fire for people to go against the administration just because her preferred candidate for president, Mar Roxas, lost.